Teachers are relying more heavily on classroom projectors at all grade levels, but especially high school. Designed for education, the Hitachi CP-X2020 XGA Projector is extremely portable, weighing just under five pounds. The vivid picture quality is realized through the 3LCD technology, which delivers authentic color reproduction. The CP-X2020 has 2200 ANSI Lumens of brightness and a 500:1 contrast ratio, ensuring your presentations will be bright and well-defined in any classroom. Designed for education, the Hitachi CP-X2020 XGA Projector is extremely portable, weighing just under five pounds. The vivid picture quality is realized through the 3LCD technology, which delivers authentic color reproduction. The CP-X2020 has 2200 ANSI Lumens of brightness and a 500:1 contrast ratio, ensuring your presentations will be bright and well-defined in any classroom. The CP-X2020 is equipped with vertical keystone correction, manual focus and 1.2X manual zoom. It is compatible with all current HDTV and NTSC, PAL and SEACAM systems. The native resolution is 4:3, but it's compatible with 16:9. The CP-X2020 also has dual PC, composite, component and s-video inputs. There are two audio inputs that utilize a 1W built-in speaker, which eliminates the need for external speakers. If you are using an external speaker source, the CP-X2020 has a mini stereo audio output as well. The control terminal for network connection is an RS-232 9 pin D-sub jack. If you are connecting to a network through the RS-232 terminal, the CP-X2020 can be integrated with Crestron and AMX Device Discovery, which allow for remote operation and audits of network projectors. 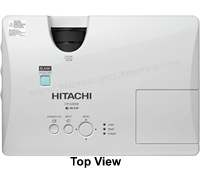 Hitachi has outfitted their education series projectors with Whiteboard Mode and Template Function as well. Whiteboard Mode limits the peak white by changing the gamma curve. This protects the eye health of students and teachers. The Template Function offers a choice of four line templates that can be projected onto the whiteboard, which aide in writing and drawing on the whiteboard. Since the CP-X2020 is ideal for the classroom, Hitachi has made sure to incorporate plenty of security measures. There is a PIN Lock that requires a PIN code to unlock the projector for operation. If the projector is moved without unlocking the PIN, there is a Transistor Detector that disables the projector, thwarting the efforts of any would-be thieves. You can also use MyScreen and MyText to put school logos, classroom numbers, location and model information on the start-up screen. This will clearly identify ownership and the location where the projector belongs. The CP-X2020 is also highly customizable for quick operation. You can change the input source names to quick, simple titles instead of the cumbersome factory titles that come programmed. The Blank Button on the projector lets you turn it into a shortcut for any projector command and it also hides the projector image with one quick touch. On the remote, there are two customizable buttons. One allows quick one-touch personalization of any projector command. The other can be turned into a third source key for a document camera. The CP-X2020 is also great for education because it afford users with a low cost of ownership. The hybrid filters are designed to last 5000 hrs before maintenance is needed. They require less cleaning and even the lamp is rated to last up to 4000 hrs, when running the projector on Eco-Mode. There is a Power Saving Mode that reduces power consumption to a highly-efficient 0.5W when using 120 volts and the Audio Pass Through lets you use the speaker for music or talking through the mic when the projector is in standby mode. Looking at all these features together, the CP-X2020 reveals itself as highly portable, affordable, customizable.